Our superb skippered sailing yacht is available for hire for Caribbean yacht charters either for day sails or for longer cruises up to the Grenadine islands. The Grenadines are beautiful, unspoilt islands with a myriad of turquoise bays and anchorages to explore. These include the Tobago Cays, breathtakingly lovely and totally untouched by today's commercialism, Mustique, conjuring up images of an idyllic lifestyle only glimpsed by a privileged few, and Bequia, resonant of days gone by when life was lived at a relaxed pace. Your own luxury yacht will take you through these magical islands in comfort and style. 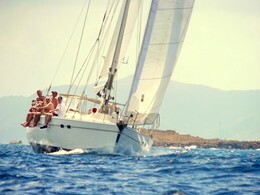 Kal Ikal is a Jeanneau Sun Odyssey 51 - a spacious 50 ft sailing sloop. Fully refurbished in 2005 she boasts a full range of new Simrad navigation systems and autopilot, GPS and radar, plus electric windlass. She comes complete with a new Caribe dingy and 15hp outboard engine. The huge cockpit area allows easy sail handling, with all lines leading back to the cockpit, plus plenty of room for relaxing, dining and soaking up the sun. A large, uncluttered deck area makes it easy to move around the boat and offers plenty of sunbathing space, while the sugar scoop back makes for easy swimming off the boat. Down below there is a master cabin and two further bedrooms, each with their own head, a large saloon for on-board entertaining and a well-equipped galley. See the photos below which will enlarge if you click on them.